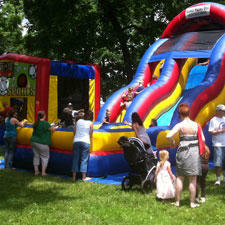 BounceHousesOhio.com has been providing quality event rental services throughout the greater Columbus Ohio area and with that comes the experience and resources you can trust with your school and church events. With one call you can speak directly with one of our professional event planners and they help guide you to things like age appropriate activities, suggestions on best practices, and ideas on how you can have a very succesful event and bring it in on budget. Many of the most valuable things you find at Bounce Houses of Ohio aren't all the cool inflatables and attractions, but the experience and character of our people. We'll help put together the right combination of equipment and help put you on the path to becoming a Party Pro yourself. We have hundreds of items to choose from like the popular bounce houses, bounce & slide combos, inflatable obstacle courses, games and much more. We can explain the pros and cons of each in how they can fit in with your plans. Bounce Houses of Ohio is licensed and issued in the state of Ohio, so you can be sure all our attractions are inspected, safe and ready to go to work at your event. In addition, every unit is cleaned and sanitized before every rental. Safety is our number one priority. So if you're getting ready to start your planning, or if you had the misfortune of placing your trust in the wrong company and find yourself in a scramble to get things together last minute? No problem! Give us a call at (614) 256-0816 and we will be happy to assist you and make what might seem a big job, easy and simple. We can create custom event packages that will meet your needs and more importantly, your budget.